The bioactive coatings are applied on the medical devices in order to reduce the penetration of the bacteria and enhance the functionality of the devices. The bioactive coatings impart the biocompatibility to the devices. The bioactive coatings include the bio-ceramics, extra cellular matrix and biological peptides. These devices are primarily used for the development of the orthopedic prosthetic .It reduces the bacterial adhesion and prosthetic infections. The companies operating in the bioactive coatings market are continuously developing bioactive coatings containing antibiotics, nitric oxide, silver and others. The rising application of the bioactive coating medical devices for the surgeries is anticipated to boost the growth of the global bioactive coating devices market during the forecast period. Thus, the global bioactive coating devices market is anticipated to attain significant CAGR during the forecast period. The global bioactive coating devices market can be segmented on the basis of product type, material, end-user and region. On the basis of product type, it is sub-segmented into hydrophilic coatings, anti-microbial coatings, drug eluting coating and others. The anti-microbial coatings are anticipated to showcase significant growth during the forecast period. The anti-microbial coatings prevent the growth of the micro-organisms on the medical devices which increases the shelf life of the devices. On the basis of material, it sub-segmented into carbon-based materials, biological materials, polymers and synthetic and metals and alloys. On the basis of end-user, it is sub-segmented into diagnostics centers, hospital, clinics and ambulatory surgical centers. The hospitals is the largest sub-segment for the end-user segment during the forecast period. The presence of the highly developed healthcare infrastructure in the hospitals coupled with the presence of the expensive equipment is anticipated to be the major reason for the growth of the sub-segment during the forecast period. The increasing demand for the medical implants is anticipated to be the major growth driver for the global bioactive coating devices market during the forecast period. Additionally, the increase of the therapeutic coatings for the implants is expected to propel the demand of the bioactive coating. The increasing trend of the using orthopedic implant coatings for surgical procedures in hospitals, clinics and others is also driving the bioactive coating devices market across the globe. The increasing bacterial growth and contamination of medical devices is predicted to fuel the market growth of the global bioactive coating devices market during the forecast period. 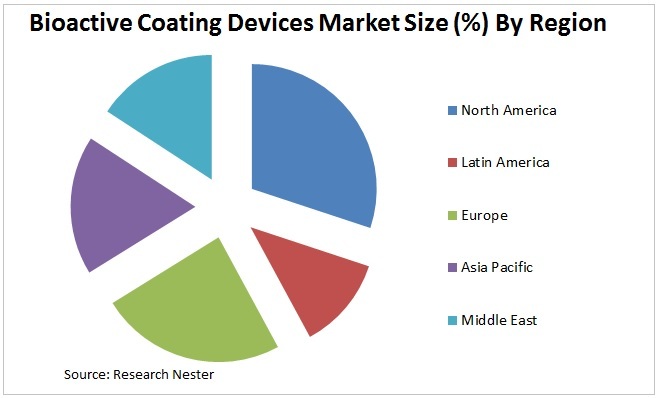 The high cost associated with bioactive coating devices coupled with the lack of research funding for developing enhanced product is expected to hinder the market growth of the global bioactive coating devices market during the forecast period.